Optimize your influencer marketing strategy! For a successful influencer strategy, it is important to establish a targeted communication within a qualified audience in order to improve the brand image. Our agency is specialized in influencer marketing and will detect for you the most promising profiles of influencers, which are adapted to your line of business. Accordingly we will plan the contribution they could bring to your marketing strategy. In 2017, 87% of advertisers used influence marketing to gain recognition, visibility and sales. Influence Marketing is a technique that has highly developed with the extension of the Social Media platforms (Facebook, YouTube and Instagram). Social Media is displacing the mass media and is the influencers’ privileged communication channel. These opinion leaders have the capacity to capture and engage your audience, and at the same time they also contribute to promote your products or services. They succeed to touch and to approach your audience better than the brand itself due to their reputation and credibility. They have created a special affinity with their specific audience, making people more receptive to their communication. Considered as reliable partners by their followers, influencers are able to elevate your product towards your target audience. 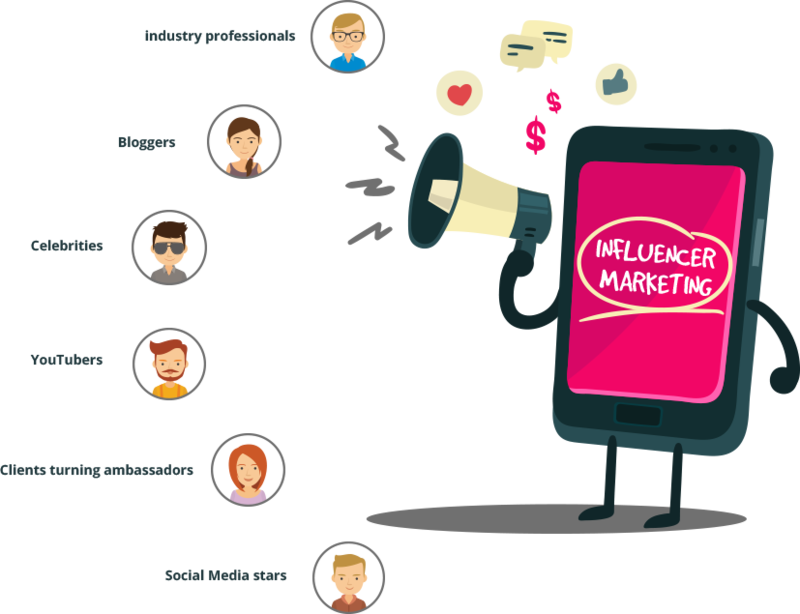 Consequently, influencers improve your credibility and are an excellent tool to improve your digital objectives. Notoriety, traffic generation, conversions, product promotion, visibility… The digital objectives are varied and the first step for a successful influencer strategy is well-defined objectives. Define the target audience you want to reach thanks to your influencers. The tone of voice, the communication lines and the content vary according to the audience type. Therefore it is very important to know the characteristics of your target audience, as this will lead you to the choice of your influencers. Influencers need to be aligned with your brand values and to transmit it. Select the most significant influencers, and not the ones who have the most powerful audience. 72% of the marketers agree that in terms of engagement, the relevance dominates the coverage. To increase your notoriety towards your target audience, it is more effective to multiply the significant micro-influencers instead of recruiting one star influencer. It is more advisable for your brand to leave the freedom to your influencers for the content creation. According to the sector of your brand, they know what works and what doesn’t with their community. As for all marketing actions, your influencer strategy should be tracked and measured in order to optimise it and to realign it if there is any requirement. Our agency, specialised in influencer marketing, seeks for the most suitable influencers for your sector. We program the contribution of the influencers and monitor the strategy. WHAT IS EMINENCE OFFERING FOR YOUR COMMUNICATION STRATEGY? We attach great importance on the measurements in order to recognize the influencers who have generated the highest engagement rate and eventually to nominate them as ambassador of your brand. Please contact us via our form and benefit from our expertise in influence marketing and optimising your digital ROI!